MoSS may be a new name to some in the music game, but his production credits are instantly recognizable. Ghostface Killah’s smash hit “Kilos”, Raekwon's "Have Mercy", Obie Trice's entire "Special Reserve" album and most recently a collaborative album with Eternia "At Last" released on Fatbeats. The Canadian-born, Toronto area resident has been bubbling just below the surface of worldwide notoriety for quite some time, and is now preparing the release of his debut production album featuring the likes of Joell Ortiz, Slum Village, Ill Bill and the lead single "Started" feat. AZ, DJ Premier & Joe Budden. MoSS got his first taste of notoriety by working with Obie Trice (Shady Records) around 2000. Moss was producing records for Obie – including both his independent singles "Well Known" and the 12” “Mr. Trice” – which created the buzz that eventually led to Obie’s major label deal. Since then, MoSS has produced for a long list of “who’s who” in the Hip Hop world, including: Joell Ortiz, Ghostface, Papoose, Peedi Crack, The Game, Slum Village, Boot Camp Clik, Red Cafe, Mr Easy, AZ, Bounty Killa, D-Block (Styles P and Sheek Louch), Termanology, Big Shug, M.O.P., Kool G. Rap, Ras Kass, Omilio Sparks, Proof of D12, and the list goes on. A former member of DJ Premier’s production label, “Works of Mart”, as Premier’s first ever production signee, MoSS is not only an emcee’s producer, but a producer’s producer as well. Recognized by an elite group in his field, he is known by many as a record digger. Having assisted on price guides, rare record books and various musical anthologies, MoSS eventually started his own reissue label 'Strawberry Rain' that specializes in re-releasing rare psychedelic music from around the world, including countries like Indonesia, Iran, France and even Zambia where he travelled to find records and artists. His label has gained recognition across the globe and his releases have been reviewed in everything from Guitar Player magazine to an Indonesian division of Rolling Stone Magazine. A record collector in the truest sense of the word. 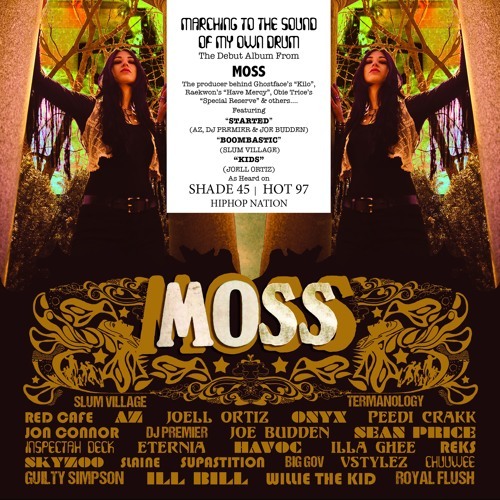 MoSS has been recognized in publications such as Rollingstone, SPIN,Scratch, People Magazine, Pound, Fadeout, and more. Production credits combined, the talented producer has sold over 2 million records worldwide.